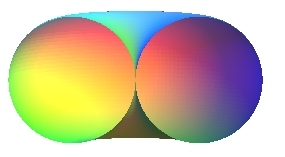 From the Latin torus "cushion, bulge". Cartesian parametrization the coordinate lines of which are the meridian and parallel circles: . Cartesian parametrization the coordinate lines of which are the Villarceau and parallel circles, in the case a > b (e = 1 for one family of circles, -1 for the other one): Cartesian equation: i.e. .
Volume and area for . 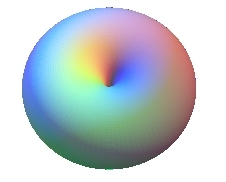 The torus is the surface generated by the revolution of a circle (C) around a line (D) of its plane; it is therefore a tube with constant diameter and circular bore. 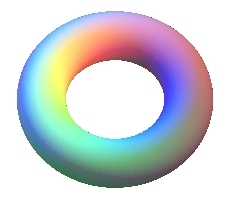 Here (D) is the axis Oz, b (minor radius of the torus) the radius of (C) and a (major radius of the torus) the distance from its center to (D). If (D) is secant to the circle (a £ b), we get the spindle torus, shaped like a pumpkin or a cherry with the limit cases of the sphere, if (D) is a diameter (a = 0), and the horn torus if (D) is a tangent of the circle (a = b). 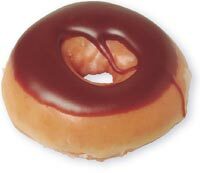 Otherwise (usual case a > b) we get a ring torus, shaped like an inner tube. The strip located between two neighboring Villarceau circles looks like a Möbius strip but is not one since it has two edges. 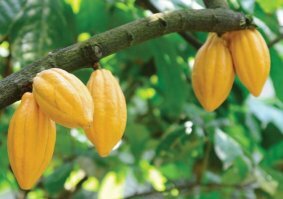 It has one twist. 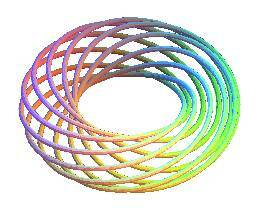 The curves traced on the torus are the spirics (or toroidal curves). See, in particular, the geodesics, the asymptotic lines and the rhumb lines of the torus. 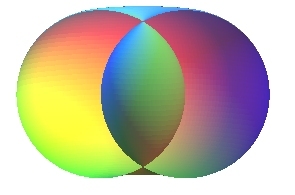 For the contour of the projection of a torus, see toroid. 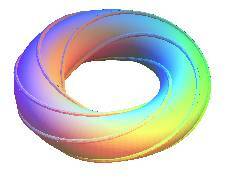 The inverse surfaces of the torus are the Dupin cyclides. For a special torus, see Wilmore torus. 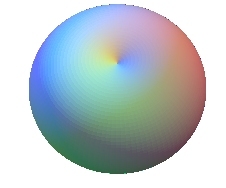 For the torus as a topological notion, see the next surface. 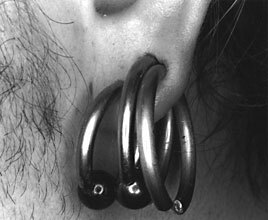 See also the Bohemian dome, Clifford's torus, and the sine tori. A torus with its Villarceau circles, museum of the charity of Notre-Dame, Strasbourg, 16th century. 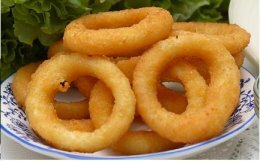 Americans call the torus donut like the pastry, but in gastronomy, there are other tori like the onion rings... Lots of fruits are shaped (very approximately) like the internal part of a spindle torus (above, the fruit of the cacao tree). For the external part, think of a tomato. 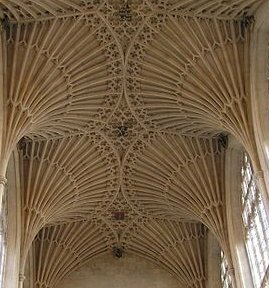 These fan vaults are shaped like the internal parts of the horn torus.